Dr. Shannon serves the Chattanooga regional area and is licensed in both Tennessee and Georgia. Check our service area map for more details. Keeping pets at home for treatment provides lower risk of disease exposure, reduced stress, and a special boost to helping us get to know your pet in its own environment. Read more. Check out Claws and Paws' facebook page for fun pet posts, customer photos, and service discounts. Put the pet carrier away. Your pets will thank you! 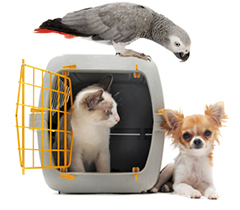 Skip the hassle of loading your pet into a carrier and waiting for the doctor to see you. Your pets will thank you! Dr. Shannon comes to you, providing top-quality care in the comfort and familiarity of your pet’s home turf.